The image below will be shown throughout this article with different pins / pin functions highlighted such as port pins, power pins, dedicated pins, oscillator pins, debug pins, etc. VBAT – backup power for RTC, external 32kHz oscillator and backup registers. BOOT0 – selects boot mode, boots from main Flash when 0. 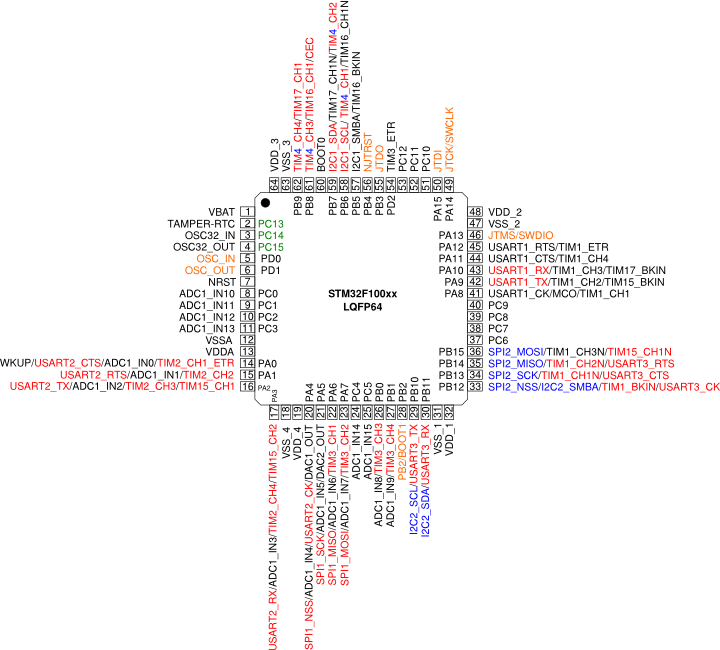 The diagram below shows the top view of a STM32F100xx microcontroller in a 64 pin LQFP. The power and dedicated pins are highlighted. 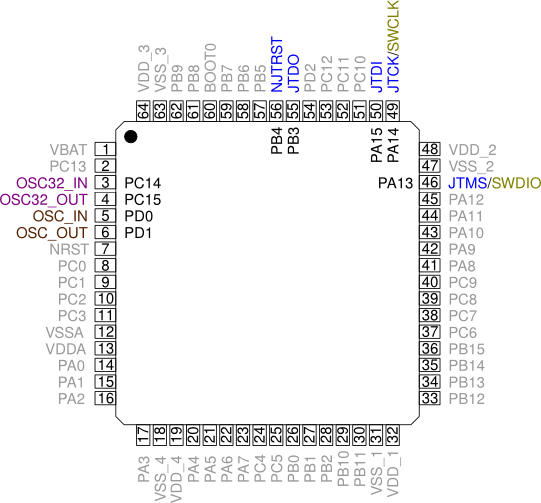 The image below shows the oscillator pins and the JTAG / SWD pins highlighted. The main oscillator pins are shown in brown and the 32.768kHz oscillator pins are shown in purple. JTAG pins are shown in blue. The JTAG pins are dedicated to JTAG functionality at reset and these pins are not GPIO pins by default. The SWD (Serial Wire Debug) pins shown in olive share two of the JTAG pins. 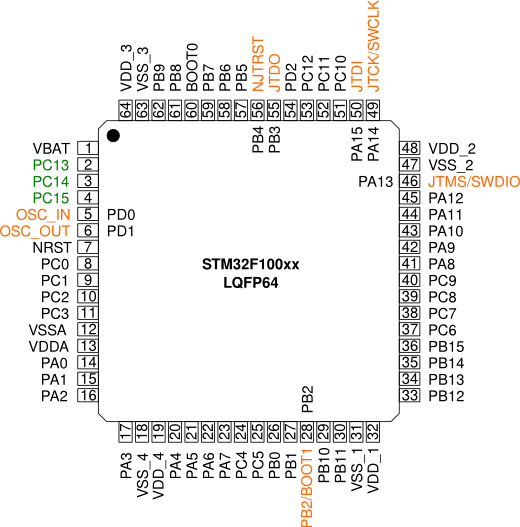 STM32F100xx LQFP64 microcontrollers have the default pin functions shown below after reset (shown in orange). The pins shown in green will be port pins as shown after power-up. However, if the microcontroller is later reset, their function will depend on the contents of the Backup registers which are not reset by the main reset. Note also that the function of PD0 (pin5) and PD1 (pin6) can be remapped by software. The image below shows the alternate pin functions of STM32F100xx devices. The alternate functions are the internal peripheral device connections to the external pins. Alternate functions shown in red can be remapped to other port pins. The port pins that they can be remapped to are not shown. Alternate functions shown in blue are not available in low density STM32F100 devices. 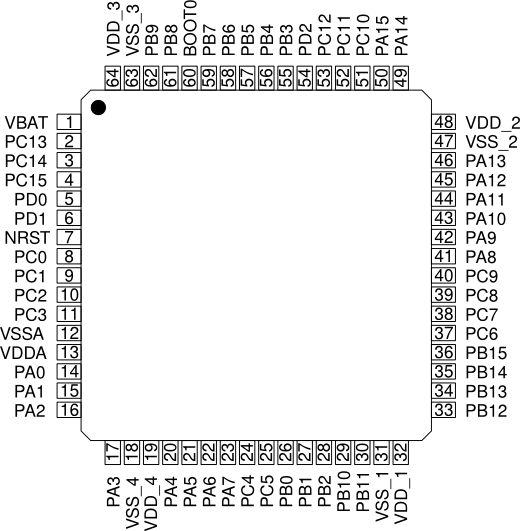 These are the second I²C port, the second SPI port and TIM4. TIM4 is shown in red and blue as it can be remapped and does not exist on low density devices.